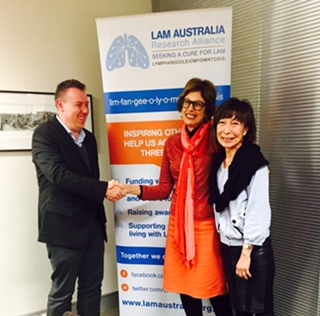 The AGM of LAM Australia Research Alliance was held on 01 June 2015, Worldwide LAM Awareness Day. Dr Brian Oliver, Head of LAM research at the Woolcock Institute, replaced Janet Neustein as President. Janet had served on the Executive continuously since she helped found it in 2006. Michael Neustein continues to serves as Treasurer. The committee includes two past members, former Vice President , Melanie Hawyes and Pat Evans; and two new members, Faith Wieland and Yasuko Wilson.